We Recommend this All Inclusive Alaska Vacation Package if . . .
1. 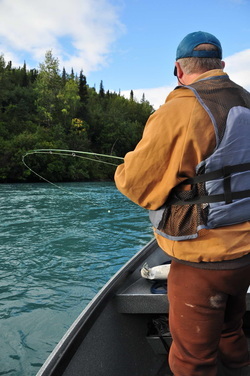 You're excited to fish in Alaska's salt and fresh water. 2. You would like to keep fishing for a different species even after catching a limit on others. Deposit of 25%. Balance due 90 days prior to arrival unless payment plan is arranged. Payments and balance will automatically be charged to the credit card on file. Additional charters or other charges will automatically be charged to card on file. All charters are considered full day and are a minimum of 8 hours. Charter may be deemed over once limits are reached unless other arrangements have been made. We are fully insured and all guides are fully licensed and permitted by all agencies and associations including the Coast Guard. Our boats are customized Willie power and drift boats. Call for discounts for groups in increments of 4 people, 8 people, 12 people or more. Family and military discounts are also available.